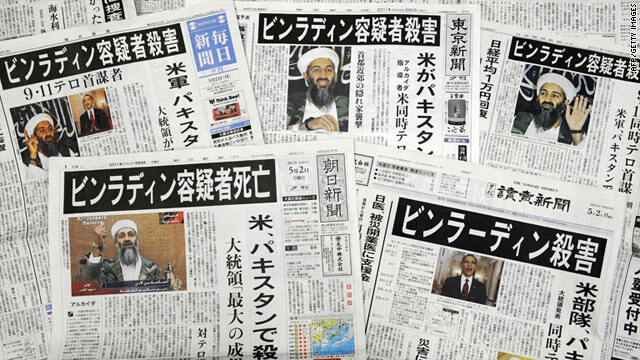 A collection of Tokyo evening papers carrying the news of the death of Osama bin Laden on their front pages. Afghan President Hamid Karzai said his country is "not the place of terrorism"
(CNN) -- World reaction poured in early Monday after President Barack Obama's announcement that terror leader Osama bin Laden was killed in Pakistan. The United States put its diplomatic facilities around the world on high alert and issued a global travel warning for Americans. Karzai said he hopes the world believes that his country is "not the place of terrorism" after the announcement that the al Qaeda leader was killed in neighboring Pakistan. "If the international troops/forces are true allies of the Afghans -- they should come out and say that the killing of Afghans, children and elders which took place over the many years on a daily basis was not a good idea," Karzai said on RTA TV. Bin Laden's killing proves that Pakistan is a "haven" for terror groups, according to Abdullah. "Killing of Osama bin Laden is pleasant news for Afghans, and now it's proven that al Qaeda and other terrorist organizations are not based in Afghanistan and Pakistan is a haven for them," he said. "We have never been supporters of al Qaeda or any violence against civilians. This is a permanent and agreed upon Arab position regarding al Qaeda and any activities against civilians. And of course, our position against international terrorism is known." Gillard congratulated the U.S. on the operation, and said she acknowledges the role of Pakistan in the fight against terror. "Our fight against terrorism does not end with bin Laden's death. We must remain vigilant against the threat posed by al Qaeda and the groups it has inspired," she said. "We will continue our support for the counterterrorism efforts of the United States and our partners, and we will continue our efforts in Afghanistan to ensure that the country never again becomes a safe haven for terrorism." "I welcome this development. I congratulate the United States on the success of the operation. Osama Bin Laden will no longer be able to bring terror and murder and mayhem to the world." "Osama bin Laden was responsible for the worst terrorist atrocities the world has seen -- for 9/11 and for so many attacks, which have cost thousands of lives," he said. "This is a time to remember all those murdered by Osama bin Laden, and all those who lost loved ones," he said. "It is also a time too to thank all those who work round the clock to keep us safe from terrorism." China believes "the death of Osama bin Laden is a milestone and a positive development for the international anti-terrorism efforts," Jiang said. "China believes that it is necessary to seek both a temporary solution and a permanent cure in fighting terrorism and to make great efforts to eliminate the soil on which terrorism relies to breed." "Osama bin Laden was a criminal responsible for heinous terrorist attacks that cost the lives of thousands of innocent people," Barroso and Rompuy said in a joint statement. "His death makes the world a safer place and shows that such crimes do not remain unpunished." Sarkozy said bin Laden's death was a result of a "remarkable U.S. commando" operation. "Osama Bin Laden was a promoter of the ideology of hatred and was the chief of a terrorist organization responsible for the deaths of thousands of victims, especially in Muslim countries," he said. "For his victims, justice has been done. Today, in France, we think of them and their families." "With the commando action against Osama bin Laden and his killing, the U.S. military has achieved a decisive strike against al Qaeda," she said. "At his command and in his name, terror was enforced into many countries against men women and children, Christians as well as Muslims. Osama bin Laden suggested that he was operating in the name of Islam, but in reality he makes a mockery of the fundamental values of his own and every other religion." Iranian Foreign Ministry The Islamic Republic of Iran hopes that the death of Osama bin Laden will put an end to war and the killing of innocent people and restore peace to their region, according to the Islamic Republic News Agency. The IRNA website reports Foreign Ministry spokesman Ramin Mehmanparast reacted to news on bin Laden's killing by U.S. troops by saying, "The Islamic Republic of Iran believes that foreign countries now have no excuse for military buildup in the region to fight terrorism." The prime minister condemned the killing, describing bin Laden as a Muslim "mujahid" or holy warrior. Al Qaeda and the Islamist radical group Hamas have no official relationship, but the Palestinian conflict with Israel has been the subject of frequent audio messages from al Qaeda. India applauded the killing as a "historic development and victorious milestone in the global war" against terror. "Over the years, thousands of innocent lives of men, women and children have been tragically lost at the hands of terrorist groups," the minister said. "The world must not let down its united effort to overcome terrorism and eliminate the safe havens and sanctuaries that have been provided to terrorists in our own neighborhood." "Israel joins in the joy of the American people on this historic day in which Osama bin Laden was killed. ... This is a resounding victory for justice, freedom and for the joint values of all the countries that fight side by side determinedly against terror." "The end of bin Laden is a great piece of news for the free world," Peres said. "This man was a mega murderer, he killed thousands and thousands of people, people who were totally innocent, and would continue to kill, his purpose in life was to kill anybody who doesn't belong to him." The foreign minister said "this is a great victory for the United States and for the entire international community" in the fight against terror. "It is a victory made possible by the determination of the United States in their hunt against the one responsible for the most tragic episode at the beginning of this century, 9/11, and numerous other tragedies," he said. "A victory that rewards the efforts that all of us next to the United States have fought and continue to fight against terrorism. A victory of good against evil, of justice against malignancy. It is a victory of the free and democratic world." Spokesman Noriyuki Shikata said the nation would continue its work with the international community to combat terrorism. "We pay our respects to the efforts of those concerned, including the U.S. and Pakistan. We regard this as part of a united effort to fight against terrorism," Shikata said. "Japan has been working on assistance to both Pakistan and Afghanistan, and proactively tackling the issue of terrorism." The nation, which was bombed by al Qaeda in 1998, called his killing a "defining moment in the fight against" terrorism. "Kenya was the first country to be attacked by al Qaeda and Osama bin Laden's death comes as a relief to many of the victims of the bombings in East Africa," the spokesman said. "The harm that Osama Bin Laden has inflicted to the image of Islam and the Arab causes is no less than the harm caused by enemies to the causes of Muslims and Arabs everywhere. ... Our national and Muslim history will not forgive this man. He has been, for two consecutive decades, a black mark in this history, and voluntarily poisoned the minds of thousands of youth with the culture of terrorism and killing and sabotage and destruction, and has placed Islam, which is a religion of justice and forgiveness and dialogue and good deeds, in a hostile position towards other civilizations, religions and cultures." "Few will mourn the reported death of Osama bin Laden, least of all Muslims. Many Muslims will reflect on the 10 years that have passed in which our faith and our community have been seen through the prism of terrorism and security. The Muslim Council of Britain has consistently stood firm against terrorism and violence, and will continue to do so." "This is a significant success for the security of NATO allies and all the nations which have joined us in our efforts to combat the scourge of global terrorism to make the world a safer place for all of us," it said in a statement. "NATO made clear that it considered the September 11 attacks on the United States an attack against all allies. We remember the thousands of innocent lives lost to terrorist atrocities in so many of our nations, in Afghanistan, and around the world." "I would definitely view this as a major, indeed, mega-landmark event, marking the end of a life of a person who clearly was involved in outrageous acts of terror and destruction. It is certainly our hope that this would mark the beginning of an end of a very dark era." The Pakistani foreign ministry issued a statement confirming the terror leader's death. "In an intelligence driven operation, Osama bin Laden was killed in the surroundings of Abbottabad in the early hours of this morning. This operation was conducted by the U.S. forces in accordance with declared U.S. policy that Osama bin Laden will be eliminated in a direct action by the U.S. forces, wherever found in the world," the ministry said. "Earlier today, President Obama telephoned President Zardari on the successful U.S. operation which resulted in killing of Osama bin Laden." The ministry said the killing highlights the resolve of Pakistan and the international community to combat terrorism. Russia said it is ready to help step up efforts to combat terror, saying only joint efforts can produce results. "Russia was among the first countries to face the dangers inherent in global terrorism, and unfortunately knows what al Qaeda is not from hearsay," the Kremlin said. "Retribution will inevitably reach all terrorists." "This is good news because it has put an end to the symbolic leader of international jihadi terrorism, the al Qaeda chief, the head of the most dangerous terrorist organization in the world." "Terrorists and leaders of terrorists are captured alive or dead sooner or later," Gul said at a news conference. "It should teach a lesson that the leader of the world's most dangerous and sophisticated terrorist organization is captured this way. The East African nation pledged to continue its fight against terrorism. Ugandan troops are part of an African Union force helping fight the al-Shabaab -- an al Qaeda proxy -- in Somalia. "Uganda shall continue to support the ongoing fight against global terrorism and renews its commitment to bring to justice those who commit acts of terror in the country," the spokesman said. The death of Osama bin Laden, announced by President [Barack] Obama last night, is a watershed moment in our common global fight against terrorism...... The crimes of Al Qaeda touched most continents, bringing tragedy and loss of life to thousands of men, women and children. ...This is a day to remember the victims and families of victims, here in the United States and everywhere in the world." "Osama bin Laden, as we all know, had the very grave responsibility of spreading division and hatred amongst the people, causing the death of countless of people, and of instrumentalizing religion for this end," he said. "In front of the death of man, a Christian never rejoices but rather reflects on the grave responsibility of each one in front of God and men, and hopes and commits himself so that every moment not be an occasion for hatred to grow but for peace." A government official described the death of Osama bin Laden as "a truly historic moment." We welcome the news ... millions of people will sleep in peace tonight," the official said. "Osama bin Laden was more of a symbolic figure, a spiritual leader for al Qaeda." The official said it is too early to determine how his death will affect the war against terror. "But this is definitely a strong blow to the organization," said the official, who did not want to be named because he is not authorized to talk to the media. "The government of the Republic of Yemen welcomes the elimination of Usama Bin Laden, the founding father of the al Qaeda terrorist network. The successful operation, spearheaded by U.S. forces, marks a monumental milestone in the ongoing global war against terrorism."